How to Password Protect A USB Flash Drive without Encrypting? You might have heard about USB drive or even you might have used it earlier. This drive is also referred to as USB Flash Drive, USB stick and also USB key. It is nothing, but a data storage device that encompasses a flash memory with a combined USB interface. These drives are typically rewritable, removable and the great thing about these storage devices is that they are much smaller as compared to an optical disc. This is the reason why many people show interest towards saving their data to a USB drive, particularly when they will have to carry some data from a storage unit like a computer or smartphone to another computer, smartphone or tablet located in a different and distant location. When they cannot carry the data elsewhere and when they cannot send it through the mail as an attachment due to huge size or other reasons, USB drive can come handy. But, the problem with USB is that anybody can access the data stored in it. For instance, being a small unit, if you miss it out somewhere and if it gets to the hand of a wrong person, there are chances of identity theft and also the loss of your crucial data. So, it is better to password protect your USB drive and there is a useful tool to do this. TunesBro Folder Unbreak is data security software that is powered by AES 256-Bit military grade encryption algorithms . This application will let you protect not just your USB drives, but also your folders and files from the hands of unlawful people. 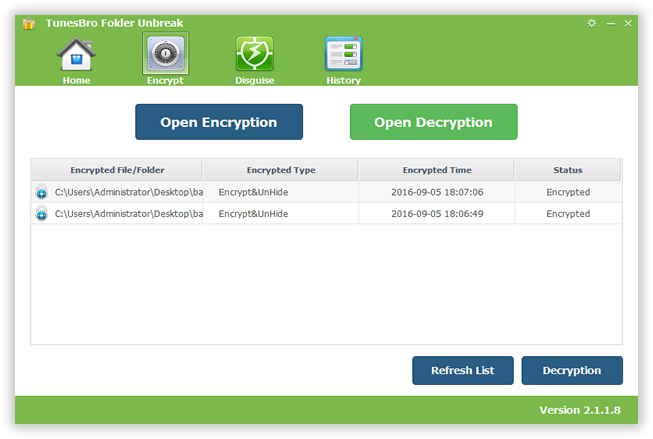 It will encrypt your most crucial files and will also backup them in real-time, and ensure absolute confidentiality of your business or sensitive data in your USB flash. You can't access to your USB drive unless you type the valid password. No body and no programs could discover or detect your password because the password was stored in an encoded form with the Secure Hash Algorithm. In addition, it will safeguard your portable drives, shared files, and drives. It can work on both versions of Windows XP, Vista, 7, 8 and 10 operating systems. In short, it can be stated as a high-end security tool to safeguard the data in your USB Drive. Also, the locking facility offered by this tool is the industry's quickest data locking system. First of all, download the Folder Unbreak and install the program on a computer. When launched, you will see a very attractive interface like this. If you need to password protect your USB flash, you need to plug USB drive to your computer first. The program asks you to choose the USB flash. Click the 'Encrypt' button on the top, and select the USB drive you want to encrypt in the pup up window. Now the program will ask you to type the password to encrypt your USB drive, just enter the same password twice and click OK. All the encrypted folders, drivers will be listed here with details. To open the encrypted file, you don't have to do anything special, just click the "Decryption" button on bottom of the program. It will pup up a windows asking you to enter the valid password. If the password is correct, then it will prompt you that you've decrypted successfully. 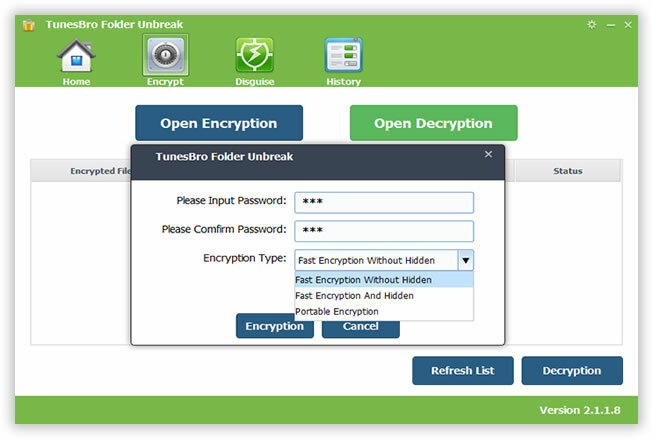 It is generally hard to find a reliable password protecting tool that will ensure secure backup,but TunesBro Folder Unbreak did it. It is a well-known and reliable data encrypt software that allows you to both password protect and encrypt the contents of your storage mediums. After USB drive has been encrypted, all sensitive files and folders it included become locked and inaccessible. That means you can detach your USB flash drive from your computer without worry and sleep well at night.